Thanks to all of you that came out on Monday night to support us! We had a great turnout and raised a lot of money for charity. Special thanks goes to Cheryl Savage, Lorene McVey, and the Lakes Area Rotary Club for helping us create and sell the Mongol Rally Guys T-Shirts. Also need to thank local artist Julie Dawson for the wonderful artwork she donated for our silent auction. 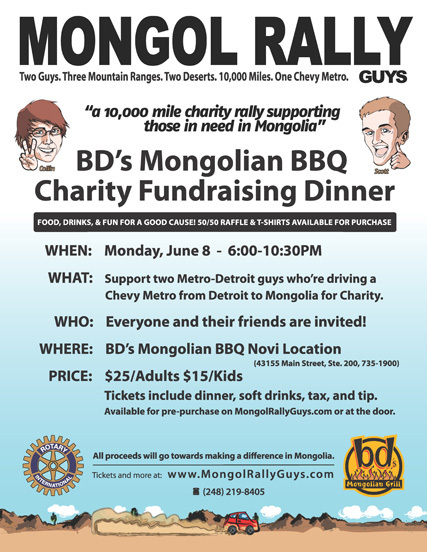 And, of course, thanks to the staff at BD’s Mongolian BBQ in Novi and general manager Julie Yohe for the great service and also the generous contribution to our charities. Pictures of the event have been posted in the Gallery, go take a look! 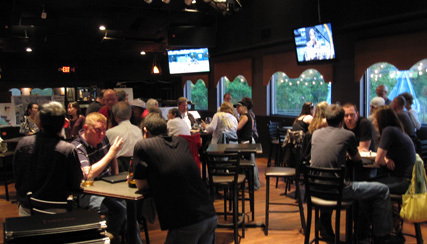 Thanks to all of you that came out to the Uptown Grille last night for our pre-send-off event—we had a great time! We have posted a couple of pictures in the gallery from the event. Be sure to mark the evening of Monday, June 8th (next week) on your calendar—it’s our largest, most important event. 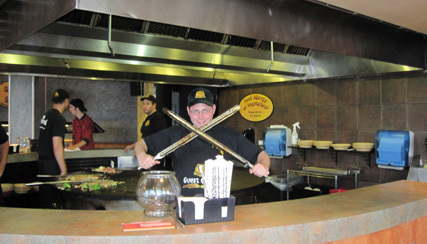 Both guys will be manning the grills to cook everyone dinner, and we will have a 50/50 raffle and a silent art auction. If you weren’t able to come last night for some reason be sure to come this time and wish Scott “bon voyage” on his trip to the UK next week.